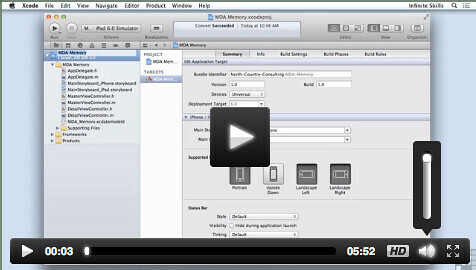 Learn to Program For Both IOS Devices And The Mac OS X Operating System. Over 73 lectures and 5 hours of content! In this Objective-C programming training course expert author Jesse Feiler teaches you how to leverage the technologies that Objective-C, Xcode and the Apple Frameworks have to offer. This course focuses on the Objective-C programming language, utilizing Xcode and Frameworks wherever necessary to build your App. You start the tutorial with a review of the Xcode interface, and how you are going to use it to build your Objective-C project. Jesse teaches you what Objective-C is, and the structure of an Objective-C App. Throughout this video tutorial you will learn about using declared properties and instance variables, how to manage memory, creating and working with classes, and how to use the debugger effectively. You will explore protocols and delegates, using blocks, handling exceptions, using selectors and much more! Once you have completed this computer based training course on Objective-C programming, you will understand how to write Objective-C code, how to utilize provided Apple Frameworks and how to use Xcode to build your App. “Learning with video tutorials is downright mind blowing.